At DB Max, we’re passionate about health and fitness and bringing large communities together as fun, inclusive and professionally organised events. Our aim is to encourage as big an audience as possible (from as diverse range of population as possible) to our events. We want to challenge, inspire and encourage healthy living. Pulsin occupy very similar territory. Creators of highly nutritious foods, their mission is to “Embrace the natural rhythm of life”. This feeds into their protein powders and snack range which are packed full of natural, wholesome ingredients. 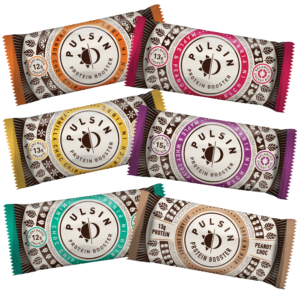 Whether you lead a busy work-life and want to a healthy mid-afternoon snack or are a triathlete in search of a protein-packed bar with ingredients you can pronounce, Pulsin have you covered. On that note, we’re delighted to officially announce Pulsin as our nutrition partner for the whole of 2019. “We are delighted to be the Official Nutrition Sponsors of DB Max races and events for 2019! Our participation in a number of 2018 events has been so beneficial and we received great support and feedback from the DB Max team. We are looking forward to a blossoming relationship in this coming year, as well as taking part in the exciting new races & challenges that the team have planned”. Heading into 2019, you can expect Pulsin to be ever-present at our events, with samples galore for you to try (careful though, you may get hooked) and we’ll be sharing lots of their super content from training tips and nutritional advice to tasty recipes and inspiring stories. Welcome to the team, Pulsin. Here’s to 2019!